Bangladesh and India on Thursday demonstrated their willingness to engage in highest-level talks to bring momentum into their bilateral relations and take it to a greater height as the two countries' 'destinies are linked'.India termed the discussions between its External Affairs Minister Sushma Swaraj and Bangladesh leadership 'constructive, productive, fruitful and successful' while Bangladeshi sees 'stronger' and 'deeper' ties with India in the coming days.However, there was repetition of assurances from Indian side for settling two major pending issues with Bangladesh-Teesta water sharing agreement and Land Boundary Agreement (LBA).Foreign Minister AH Mahmood Ali and Indian External Affairs Ministry Spokesperson Syed Akbaruddin briefed the media separately on the outcome of the meetings. "We've discussed all the issues of mutual interest in a friendly environment," the Foreign Minister told reporters at the Foreign Ministry. He said issues related to political and security cooperation, energy cooperation, trade, regional and sub-regional cooperation, water resources management, people-to-people contact and cultural exchanges were discussed during his meeting with Sushma Swaraj.The Indian Minister assured Bangladesh of working together to strengthen the existing ties between the two countries. 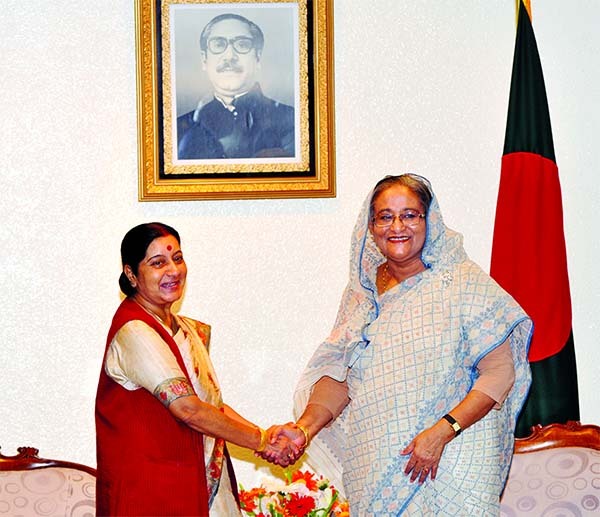 "India is always there for Bangladesh," Mahmood Ali said quoting Sushma as saying at the meeting.On Teesta issue, the Foreign Minister said efforts are there in India to build internal consensus on the issue. "She (Sushma) expressed her hope over signing the Teesta deal. "About LBA, Mahmood Ali said Bangladesh requested the Indian side for the ratification of the LBA. "The Indian Minister also expressed hope over its settlement. She also mentioned that the matter is under active consideration at the Rajya Sabha," he added.Both the countries agreed to grant five-year multiple tourist visas for Bangladesh nationals - below 13 years and above 65 years - to India, the Foreign Minister said adding that Bangladesh will import 100 megawatt electricity from Tripura state.They also agreed to increase the frequency of Maitree Express and AC coaches between the two countries apart from setting up four new border haats on Meghalaya border.The issue of Nur Hossain extradition also came up for discussion, said the foreign Minister.Syed Akbaruddin, in another press conference, said India and Bangladesh as friendly neighbors are committed to addressing issues of concern to each other. "There was an understanding that we need to promote exchanges of all types. Exchanges relating to people, relating to goods and services," he added.Terming Bangladesh a very important neighbour, he said the focus has been on Bangladesh-India connectivity during the meetings between the two sides-connectivity in terms of people, energy, transport, exchange of idea.The spokesperson said Sushma came to Bangladesh with a message for friendship and good wish, and said her conversations here were very cordial and warm.Responding to a question, he said there has been no discussion on domestic politics. "We've great respect for Bangladesh. We would never ever try to look at in terms of narrow party politics. "In response to another query, the spokesperson said, "As far as India is concerned, we're not a sanctuary for criminals. If there are any criminals in India, they'll be returned to Bangladesh. It's not our policy to give sanctuary to criminals from Bangladesh. "The spokesperson said the Indian leadership got an indication from Bangladesh leadership that Bangladesh is unequivocal and uncompromising in their opposition to terrorism-in any form and manifestation-and Bangladesh would never allow its territory to be used against India.Responding to another question, he said the Indian External Affairs Minister had talked to Chief Minister of the West Bengal. "They had a very pleasant and useful conversation. "He, however, did not go into detail about their discussions between the two seniors political leaders. "She (Mamata) wished all the success during her visit to Bangladesh (Sushma). "Meanwhile, the Prime Ministers of India and Bangladesh accepted each other's invitation for visit and the modalities of the visits will be worked out later.